Selena Gomez recently opened up about her decision to visit a rehabilitation facility in Tennessee, and the pop star seems to be doing better than ever since her departure. Selena recently wrapped up a world tour, signed a celebrity ambassador deal with Coach and produced a new Netflix miniseries called “13 Reasons Why” that airs later this month. The 24-year-old singer also nabbed her first American Vogue cover, and started up a new relationship with The Weekend — which seems to be going strong, despite the controversy surrounding it. Selena definitely seems to be in good spirits these days, and she seems keen on sharing the love with everyone else. Selena recently partnered with Coach and the Step Up Foundation to celebrate World Kindness Day, for which she made a surprise visit to a Los Angeles high school in order to speak to young girls about empowerment and the importance of self-love. After her surprise appearance at Alliance Margaret M. Bloomfield High School, Sel took a well-deserved froyo break at Menchie’s. For the outing, she wore a white Isabel Marant Etoile tank top tucked into a pair of customized high-rise skinny jeans from J Brand. She added some cool edge and color to her outfit with a Coach varsity jacket, and completed her ensemble with tousled waves, minimal makeup and a pair of black Gianvito Rossi “Portofino” sandals. These sandals are hand-finished in black suede, and feature ankle straps detailed with round buckles. They also have slender toe bands and high heels. You can buy them for $815 at Net-A-Porter or try a black leather pair for the same price at FWRD. Selena Gomez out and about in Los Angeles, California, on March 23, 2017. Selena also made headlines the day before while out with friends for a quick lunch in Malibu. She was spotted wearing a pair of Miaou “Tommy” mid-rise jeans, which feature a straight leg silhouette, a cropped length and a five-pocket style. They also feature silver hardware and grommet details. You can purchase these jeans for $325 at Miaou. These Miaou jeans have suddenly become a hot item among the a-list celebs. In fact, Bella Hadid — Selena’s boyfriend’s ex — recently wore the same pair in January while out and about in New York City. Bella styled her pair with a cropped shirt, a black hooded sweatshirt and a denim vest before completing her ensemble with a black newsboy cap, a Stella McCartney bag and caged booties from Tamara Mellon. Bella’s sister Gigi Hadid also wore the beloved Miaou jeans while out in Paris earlier this month. She opted for the red plaid pair, and toned down the print by styling it with all-black. The 21-year-old model rocked a black mesh sweater that showed off a peek of her lacy bra underneath. She added a bit more edge to her outfit with a moto jacket, Tommy Hilfiger ankle boots, a low bun, hoop earrings and a black leather bag. Selena opted to style her “Tommy” pinstripe jeans with a cropped fold-over turtleneck from Wayf. She carried a Coach handbag in black nubuck pebble leather and wore black mules from Robert Clergerie, and finished off her look with orange-tinted sunglasses and a chic bun. Selena Gomez out and about in Malibu, California, on March 22, 2017. The former Disney star wore the “Alice” mules from Robert Clergerie. 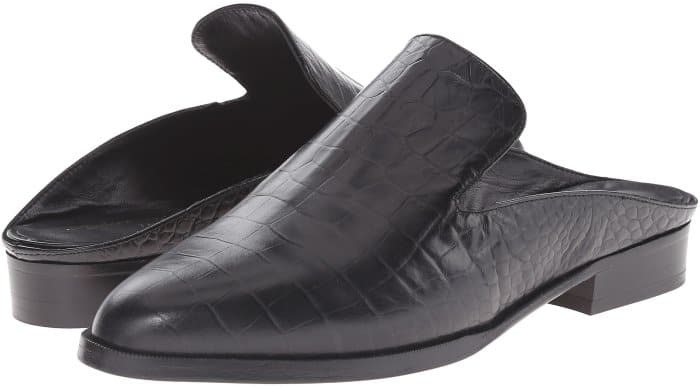 These slip-on moccasin-inspired mules feature crocodile-embossed leather, notched vamps and rounded toes. You can buy them for $495 at Farfetch or get them on sale at Zappos. Check out Robert Clergerie’s collaboration with Self-Portrait for more stellar footwear options.